A lot of consumers considered the Brooks Ricochet to be true to size. The width profiles were lauded for following the regular fit expectations of testers. The midsole unit was excellent at energizing the toe-off phase of the gait cycle, some runners observed. A couple of users appreciated the upper unit because it hugged the foot securely. The design of this running shoe was welcomed by shoe enthusiasts; they felt that the aesthetics were unique and appealing. The Brooks Ricochet gripped the ground well, some users reported. A couple of runners noticed that the laces of the Brooks Ricochet were too long. A lot of the shoe enthusiasts who have tried the Brooks Ricochet were happy with what it had to provide for them. The performance of the midsole, the preciseness of the outsole traction, the secure hug of the upper unit, and the uncommon aesthetics were elements that gained positive regard. There were some who didn’t like this neutral running shoe’s too-long laces, but such a complaint was isolated. I usually stick with one shoe when it comes to road running, which is the Mizuno Hitogami. However I was open to the idea of trying out Brooks new shoe, the Ricochet, and I was pleasantly surprised with how much I enjoyed it. I found the shoe to be neutral, very comfortable, and not overly cushioned. I have ran over 30 miles in this shoe and it shows no sign of wear or damage. I have primarily used this shoe as a training shoe for any kind of run on concrete or the treadmill. The Ricochet is Brooks’ newest neutral shoe to hit the market. New to the Brooks line is the DNA cushioning which is marketed to give you maximum energy returns with each step. Three new Brook shoes have this new DNA cushioning, including the Ricochet, the Bedlam, and Levitate 2. The Ricochet is the lightest and the cheapest of the 3 shoes. The shoe does have some tiny flaws, but these are insignificant in the long run. 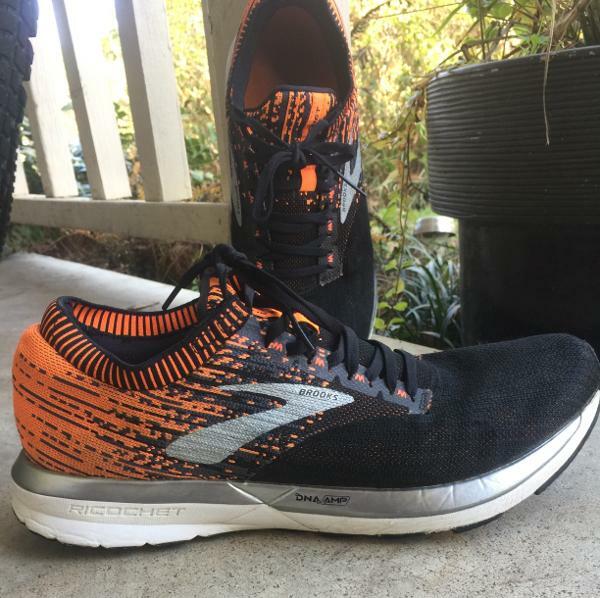 When I first received my pair of Ricochet I was surprised by Brooks desire to use a bright orange color for there three new shoes the Ricochet, Bedlam, and Levitate 2. While I am not a fan of the color orange I do think it blends nicely with the Black without being too bright. I was impressed that there are 4 color varieties with the Ricochet, which are nice options. The upper of the Ricochet is comprised of a FitNit, which is made of many different types of fabric. I have found this technology to be very durable and offers excellent ventilation. During the hot summer days, I noticed my foot stayed cool. The best feature of this material is the way it keeps my foot in place. One feature that surprised me was the comfort. I received zero blisters from using this shoe and even when I didn’t wear the shoe with socks, my feet did not blister. The heel wrap of the shoe is phenomenal and keeps your Achilles from being rubbed. The tongue of the shoe is excellent. I found it to stay in place while worn and it provided excellent cushioning without being overkill. The tongue of the shoe is as comfortable when you start your run as it is when you finish. The only negative feature of the upper in my opinion is the thin collar on the top of the shoe. I assume the collar was put in place to help keep debris out, but it never comes in contact with your ankle and offers no protection from debris. The collar may look aesthetically appealing however it just adds extra weight and bulk to the shoe. The main feature of this shoe that separates it from so many other shoes is the introduction of DNA AMP Energized Cushioning and BioMoGo DNA. This is advertised to naturally expand as force is applied, delivering a cushioned, springy feel. Brooks details that “DNA AMP is made from a soft, naturally expanding foam encased in a skin that resists horizontal expansion”. This shoe isn’t unnecessarily heavy and nor is it very light however it provides extreme cushioning that could be found on any bulky cushioned shoe. I found the cushioning to be right in the sweet spot- not too soft and not too firm, while still offering excellent protection. Throughout my many runs, I noticed that midsole of this shoe gives you the feel of constant downhill running throughout the run, as well as giving you the bouncy feel of cushion. In my experience, Brooks shoes exceed expectations in nearly every category, except for the outsole of the shoe. The Ricochet is no different. The outsole of the shoe is constructed of a rubber substance that does provide excellent durability and flexibility but does not provide adequate grip. The rubber has an arrow-point pattern with shallow flex grooves for a smoother and quicker heel-to-toe transition. I have found that the grip of the shoe is adequate on dry surfaces but once any the ground becomes wet your chances of slipping are very high. Numerous times when I was running on damp mornings I had my foot slip out from under me, causing me to trip. With over 300 miles in the shoe, the outsole still looks in excellent condition however it lacks grip and is too heavy. The Ricochet has exceeded my expectations with durability. This shoe has become my go-to training run shoe for road running and it shows little wear and tear, which is impressive for the 300+ miles I have put on this shoe. The only issue I have noticed in regards to durability is the glue remnants that is used to hold the shoe in place can be seen in certain areas, however, I noticed this when I first received the shoe and it has not become a significant issue yet. I have used other Brooks shoes in the past and they did not agree with my feet. However, I finally found a Brooks shoe that my foot thrives in. Overall like the new DNA AMP cushion and hope to see Brooks continue to use this technology for many shoes to come. I would recommend that Brooks discontinue the heel collar style due to its ineffectiveness. The Ricochet will continue to be daily trainer shoe due to its comfort, responsiveness, and cushioning. If I were to participate in the road race I might opt for a lighter shoe such as a Brooks Glycerin or Adidas Boost. I would recommend this for anyone looking for a neutral, go-to training shoe. Brooks has set out with the goal of making a lightweight shoe with a responsive ride. In some ways, the Ricochet meets those goals in other aspects it falls flat on its face. Brooks has constructed a comfortable simple upper. There is minimal stitching or overlays. The upper is constructed in two pieces one for toe box and another for the midfoot/heel area. This creates a simple shoe with minimal hot spots or areas for concern. The elastic ankle collar is also a plus. It provides the feel of a custom fit. Those runners with narrow heels and slender ankles will appreciate this feature. The ricochet was just an overall comfortable shoe. It fit well and worked with my foot right out of the box. Once again Brooks makes a shoe with a great fit. This is pretty much true of all the shoes in there line up. For the last year, I have a had the chance to put miles on 4 different Brooks models and the same can be said for all of them. They all fit great, and they run true to size. Although the mesh upper did provide comfort and seems to be quite durable, the extra material, thick mesh, and sock liner make for a hot shoe. If you do lots of running in a hot climate and don't want to be sloshing around in wet shoes, this may be a deal breaker. Brooks states on their website "own best energy return, now in a lightweight frame." To be frank, in no way is this shoe lightweight. My size 11.5 came in at just over 12 ounces. This makes it one of the heaviest shoes I own. If you're going to market lightweight shoes it should be in the 8-ounce range or less. Although the Ricochet is still heavy it does perform reasonably well during speed and interval workouts. If a couple ounces were shaved off the Ricochet, Brooks might a truly great shoe. Can it work for quite a few different workouts? Yes. Would I put this in the same category as an extremely versatile shoe like the Nike Zoom Elite? No. I personally enjoy a shoe with a bit more ground feel. The Ricochet although, responsive, felt a little overbuilt and clunky at times. As stated earlier shaving a few ounces off the shoe, maybe a couple of millimeters off the midsole might go a long way. In a word, disappointing. If a shoe is going to have so a ton of rubber on the outsole, it better grip well. This shoe struggled on wet sidewalks and asphalt. I didn't have a chance to take these off-road to the trails but, based on its performance on the road I doubt these shoes can handle much beyond a dry gravel path. Brooks earns huge points for me with a comfortable well fitting shoe. However, I feel this shoe could be a bit better if it was not so overbuilt. Shedding a couple ounces of weight and a few millimeters in the midsole could go a long way. I am so excited to provide a review on one of the newest shoes in the Brooks line up, the Ricochet. The Ricochet was recently released by Brooks as a neutral, but energizing shoe. I have to say it is different that any of the Brooks shoes that I have ran in before. While running in these shoes I have been impressed with how lightweight and comfortable they are. The goal of the Ricochet is to help provide runners with the most energy return possible, and they certainly live up to their name. 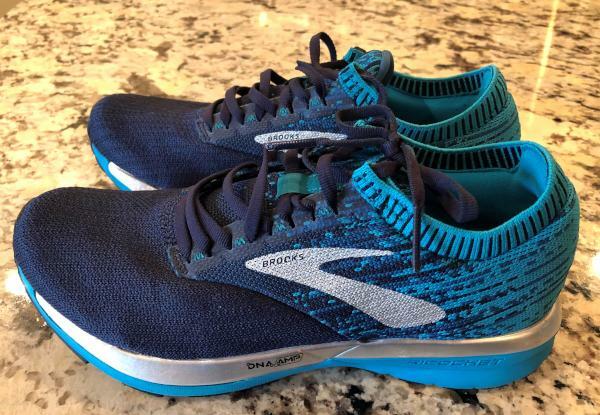 This energy return is made possible by several technology designs that Brooks has crafted into this shoe including DNA AMP energized cushioning, BioMoGo DNA, and a cushioned soft upper and heel. The most notable technology that makes the Ricochet the shoes they are, is the midsole DNA AMP Energized Cushioning and BioMoGo DNA. 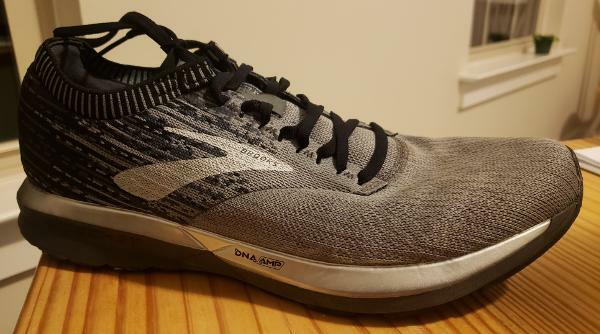 Even though they are lightweight, they do not lack in cushioning, and this is due to the DNA AMP technology that Brooks is putting in their shoes. This is a foam that provides cushioning and energy return to the feet and legs. Underneath the DNA AMP is the BioMoGo DNA foam and it provides runners with bounce and flexibility. These two features help to provide runners with a cushioned, yet energizing ride. My favorite feature of the Ricochet is the comfortable upper, the heel wrap, and hidden cushioning. Literally, as soon as you put these shoes on you will notice the difference in comfortability of the upper. The upper is knitted and it offers your feet flexibility and breathability when inside the shoe. The tongue is cushioned and doesn’t feel tight on the top of your foot when tied. The true game changer for me is the heel wrap, and the hidden heel tap that Brooks is putting inside their shoes. The heel tap provides your Achilles protection that is better than most socks. Runners no longer must worry about blisters and unnecessary rubbing because of this awesome padding. Also, the heel wrap offers additional comfort and helps lock your foot into place while running. Brooks has designed these shoes to where runners could honestly run without wearing any socks if they wanted to. The Ricochet is a lightweight running shoe weighing in at only 9.2 oz and has an 8mm drop. While running in these shoes I found that they were perfect for speed workouts because of their weight, but they also had a suitable cushion. Previously, I have ran in the Brooks Glycerin 16, which weighs 9.4 oz. Even though the difference in weight between the two shoes is small, I felt faster when running in the Ricochet than I did in the Glycerin. Additionally, these shoes are also much lighter than the Levitate as well. The Levitate is another shoe in the Brooks line up that is designed to optimize energy return and I have also run in them. The Levitate is a heavier shoe and weights 9.7 oz. So, if you are looking a shoe that provides energy return but doesn’t feel heavier the Ricochet is a great option for you. One thing that I would like to point out to readers is that while these shoes do have 'cushioning', they do not offer the same plush cushioning runners have come to love from the Glycerin 16, or the cushioning of the Levitate. If you are looking for a more cushioned ride one of those shoes is likely a better option. Another disadvantage that I noticed while looking on the Brooks website was the color options are limited compared to other Brooks shoe models. Of the four-color choices offered, they are darker schemes except for one pair. Therefore, if color matters to you finding a combination that you like might be difficult especially for everyday wear. Another disadvantage that I saw from this shoe was the pricing. They are priced at $120, just like the Ghost and the Adrenaline GTS. When comparing the price of the Ricochet to other shoe brands, runners may feel that these shoes are overpriced and be reluctant to try them since they are new. To conclude, I have enjoyed testing the Ricochet. I have found these shoes to be a great option for speed workouts. I believe that any runner searching for a neutral running shoe would find these to be an energizing ride with just enough cushion. My favorite feature, which I think is one of Brooks best new updates, is the heel padding and tab. Runners can easily take these shoes for a run right out of the box and not have to worry about unnecessary rubbing. Lastly, the thing I love most about Brooks is that they offer a 90-day money back guarantee, and they stand behind their products. So, if you do buy these shoes and they aren’t for you, you can always rest assured that you can send them back and try something different. Overall an 8/10 and a perfect shoe for everyday running and especially for longer ‘weekend’ runs. The Brooks Ricochet is a road companion for the neutral pronator. It makes use of a sporty yet contemporary design to appeal to casual shoe enthusiasts and athletic individuals. A flexible knit-material is used for the upper unit, and it’s joined by a stretchy heel-wrap collar and a sock-like internal bootie design. Underfoot cushioning is given by two proprietary foam compounds that are layered on top of each other. The top section offers energy return and resilient cushioning that doesn’t easily sag; the lower part provides a bouncy and flexible ride. This Brooks running shoe has an arrow pattern on the outer portion of the sole unit encourages smooth and fast transitions through the gait cycle. A rubber layer delivers traction and protection against the abrasive nature of the surfaces. The Brooks Ricochet was made to have a standard running shoe length. The sizes that are available accommodate the usual preferences of consumers. When it comes to width, the options are D – Medium for men and B – Medium for women. This product features a semi-curved shape that mimics the natural curve of the human foot. The outsole unit of the Brooks Ricochet makes use of a rubber layer. The job of this material is to shield the rest of the platform from wear-and-tear, as well as deliver surface traction. An arrow-shaped pattern runs from the midfoot to the forefoot. This design allows faster transitions through the gait cycle. Midfoot and forefoot strikers may find such an arrangement appealing as it encourages natural flexibility and focused surface control. A rounded heel leads the foot to have a well-rounded foot-strike. It potentially eases the landing phase and rolls the foot forward smoothly and naturally. DNA AMP is a cushioning unit that’s comprised of a full-length polyurethane compound that is covered in a TPU sheath. Such a construction prevents material sagging during the run or over time. The preservation of the foam’s structure enables copious amounts of energy to be transferred to the foot and leg of the wearer. The base of this shoe’s sole unit is made up of the BioMoGo DNA foam, it is also the same midsole technology found in the popular running shoe, Brooks Glycerin 16. It is a reactive foam that’s made using environmentally friendly compounds. It adds more bounce and flex to the underfoot experience. FitKnit is a knitted material that is able to stretch and adapt to the shape and motion of the wearer’s foot. Its thin construction and tiny ventilation pores provide breathable coverage. The stretchy heel-wrap is fundamentally a collar that hugs the base of the leg, the ankles, and the heel. It’s a helpful way to maintain in-shoe lockdown and steadiness. The internal bootie design offers a smooth wrap that’s free of hot spots and bunched-up sections, thus allowing the wearer to put on the Brooks Ricochet without socks. A faux-suede heel tab cushions the back of the foot and protects it from exiting the shoe unexpectedly. A traditional lacing system graces this road companion. It features semi-flat laces and discrete eyelets that are bolstered by a thin synthetic print. These elements work together to adjust the tightness or looseness of the fit.